The werewolf illustration is by Paul Mudie (who has some startling and striking fantasy images on his website) and design by Helena Waldron at my publishers, Floris. I think they’ve done a great job. and follow her into the shed. “The owners are away. Eve perched on a sack of compost. when she’d been possessed by Mrs Ferguson. for nosing about in my bedroom,” said Eve with a frown. “Ok, ok, I believe you! You’re definitely nippy enough. a mournful bass voice echoing faintly down the street. There was a pause, then an answering chorus of strings. “I know this one,” she said. “There’s a while to go yet. “Sounds like a laugh a minute,” said Cameron. about, trying not to stand on anything sharp. 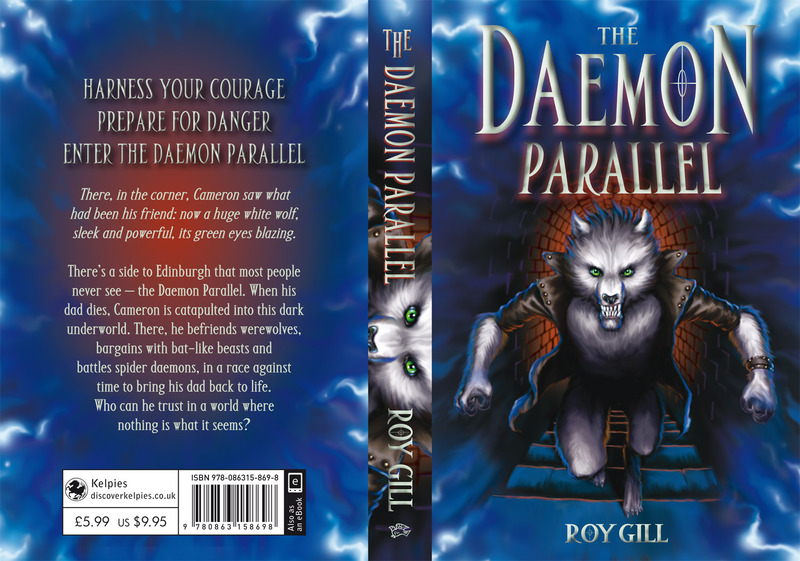 From my very earliest idea, The Daemon Parallel was always going to be set in Edinburgh – or an alternate, monster-filled version of it. In the next few blogs, I’m going to share some of the locations that inspired me. 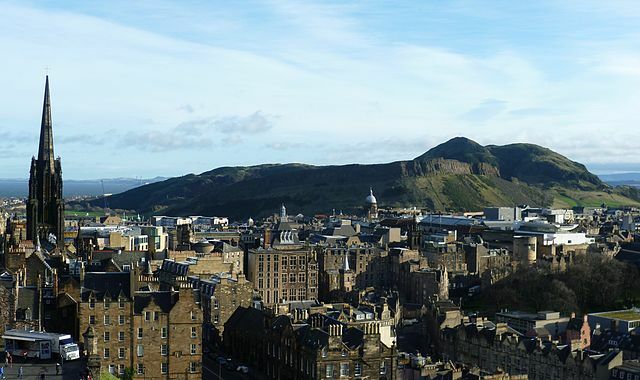 The jagged and crumpled layers of rock that can be seen on Salisbury crags were a key inspiration for the geologist James Hutton in his theory of how the Earth was made. What if… the clash of rock beneath the Earth that formed these hills also exposed something else? And who else might’ve come here to test out their theories about the world? The building that eventually was raised in its place included this stone head and inscription to mark the spot. 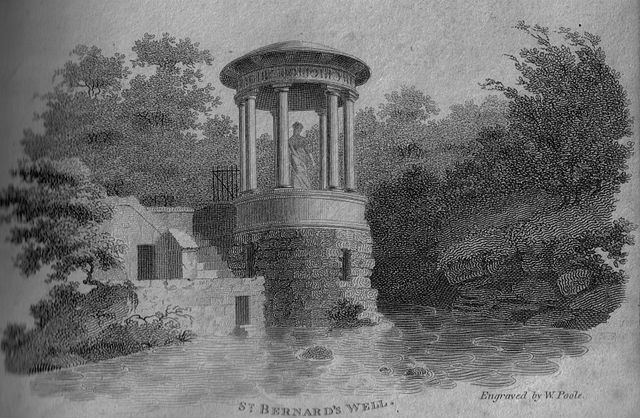 St Bernard’s Well looks someone plonked a miniature Greek temple down among all this lushness. 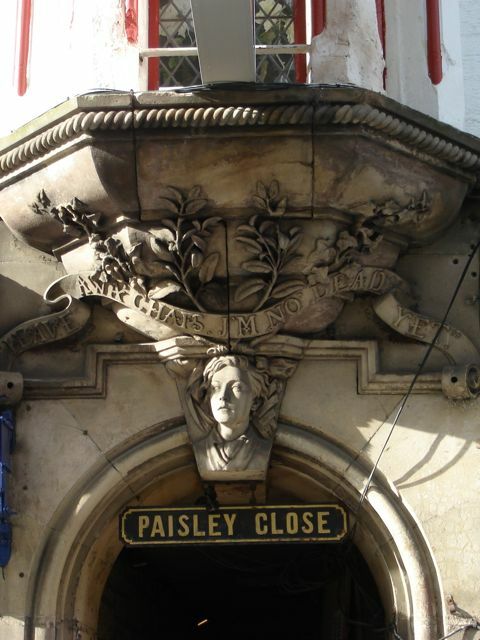 People used to go and take the water there (they still unlock the pumphouse door on special occasions – the fountain has a lion’s mouth, and you waggle his tail to make him spew out the ‘healing’ liquid). What if… this hidden location was the nesting place for something monstrous? 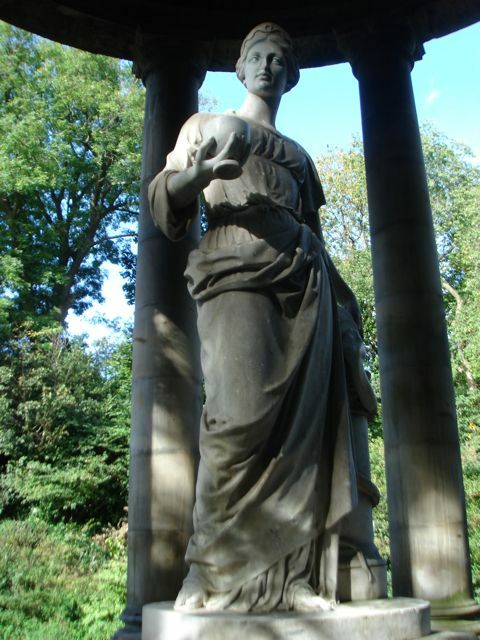 What if instead of a statue of the watery and healthy goddess Hygieia, the plinth held a perfect white egg? 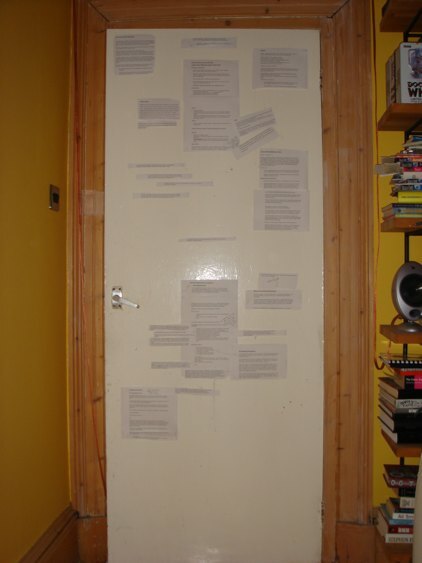 Back when I was planning Daemon Par allel – with cut-up bits of paper tacked all over the livingroom door – I wasn’t sure who Morgan was. I knew he arrived a little way into my story, and shook up the world of my main character, Cameron. I thought he might be a daemon who worked as a busker on Edinburgh’s Royal Mile, annoying tourists with his awful guitar strumming (He isn’t…). I thought he might be a wayward big brother figure, or maybe that slightly dodgy friend you had when you were a kid… the one that was fun to hang around with, but as soon as things went wrong, managed to magically disappear (He could be…). Oddly enough, when I sat down to write him, he turned up on the page fully-formed; edgy and aggressive, or easy-going and funny just as the mood takes him. He turned back to Cameron. …it’s fair to say he and Cameron have a lot to go through, before they get to know each other! 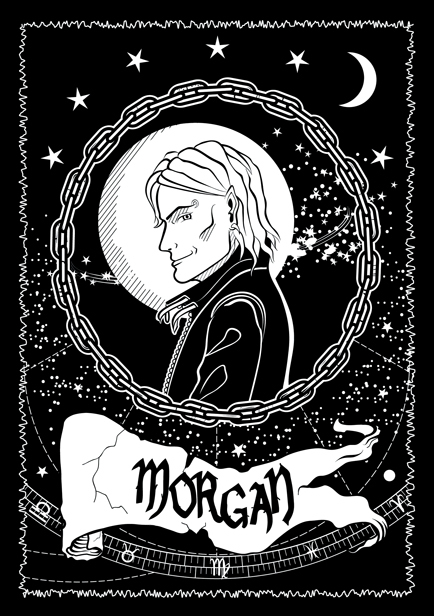 Despite his spiky attitude, Morgan seems to be a character people like. I was really pleased when my friend Kate decided to have a go at drawing him (as a practice piece for her portfolio). I think she’s captured him well, and got his wolfish grin, long tangled hair, and penchant for flashy jackets exactly right! She’s added details of her own too, like those pointy ears, and the ear and brow rings, and that marvelous stars and night sky backdrop. You can find Kate Madigan’s website here, and a little more about this drawing here.